Hello my name is Bridget Rough or as the kiddos like to say "Coach Bridget." I grew up in the Midwest and graduated from Columbus College of Art and Design with a BFA Degree. With over 10 years experience working with kids I must say I love it! I find it most rewarding watching them learn and succeed at new things. 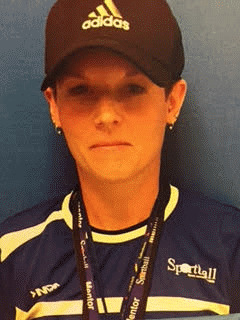 It is an honor and joy to be your children's Physical Education teacher at SCDS. I enjoy coaching them coordination and sports skills each week. I live life along the side of my loving husband, two awesome kids, and two Great Danes. In my free time I enjoy watching my kids play and compete in sports. I also love to create art and paint murals.